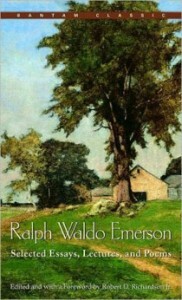 A new, wide-ranging selection of Ralph Waldo Emerson’s most influential writings, this edition captures the essence of American Transcendentalism and illustrates the breadth of one of America’s greatest native philosophers and poets. The writings featured here show Emerson as a protestor against social conformity, a lover of nature, an activist for the rights of women and slaves, and a poet of great sensitivity. As explored in this volume, Emersonian thought is a unique blend of belief in individual freedom and in humility before the power of nature. “I become a transparent eyeball,” Emerson wrote in Nature, “I am nothing; I see all; the currents of the Universal Being circulate through me; I am part or parcel of God.” Written over a century ago, this passage is a striking example of the passion and originality of Emerson’s ideas, which continue to serve as a spiritual center and an ideological base for modern thought.